Yes, delicious apple cake made in the Instant Pot. Use your pressure cooker to make this moist cake with a yummy maple glaze. 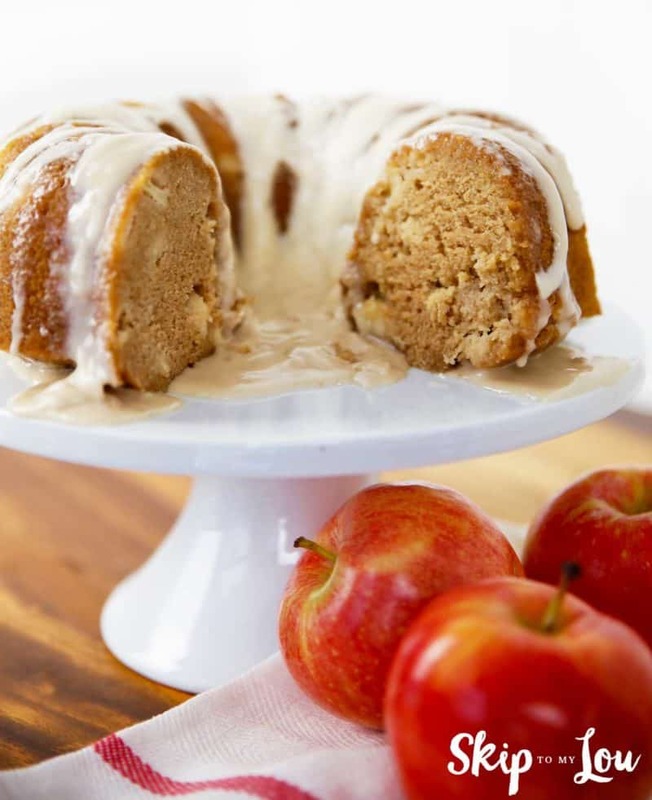 If you love apples this is a great cake for you! Not only does the Instant Pot put dinner on your table in minutes it can cook up moist heavenly desserts. The steam from the pressure lends to a super moist and dense cake. A slice of yum. I don’t know if you can stop at just one slice of this apple cake. This recipe from my friend Laura Finson that has been teaching Instant Pot classes at my shop Sweet! is a winner. I think you will find not only is a cake made in the Instant Pot in under 30 minutes is tasty and also beautiful! 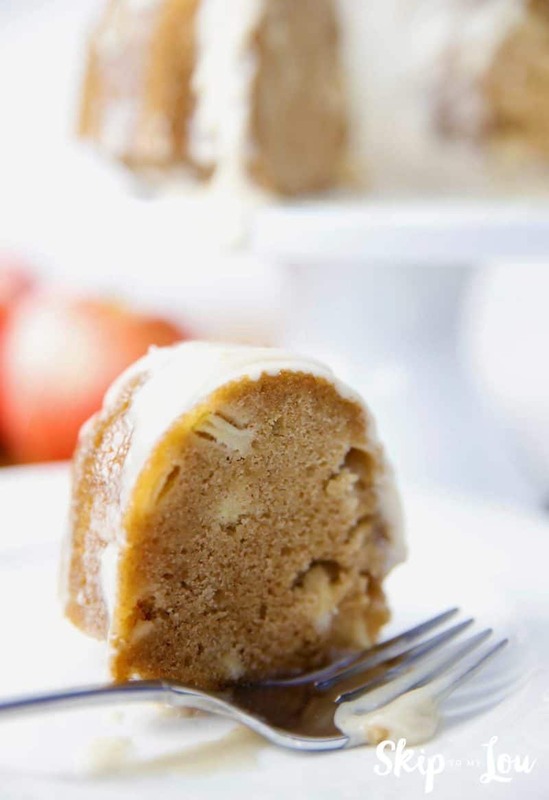 I have always loved bundt cakes and the pressure cooker is the perfect way to make them. 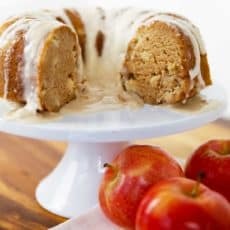 If you need instructions for making a sling to easily remove the apple cake from the Instant Pot take a look her Pumpkin Chocolate Chip Cake and Key Lime Cheesecake recipes. All the details are there. Mix up the ingredients and pour the batter into the prepared pan and cover with aluminum foil. Poke a hole through the aluminum foil where the hole is in the center of the bundt pan. A 6 cup bundt pan works perfectly in the Instant Pot. This cake is the perfect sweet and spicy, so moist and filled with apple chunks. While I am partial to the simple maple glaze made with powdered sugar I know some people prefer more of a sauce. Since I love caramel apples how about a caramel sauce. In a small saucepan, combine brown sugar and butter. Cook over medium heat until butter is melted. Gradually add cream. Bring to a slow boil over medium heat, stirring constantly. As soon as it comes to a boil remove from the heat. Allow to cool slightly and pour over the cake. What are the best apples for a cake? Choose fresh apples that have a nice balance between sweet and tart. It is also important that they don’t break down too much while baking. For this recipe, we used Granny Smith Apples. Should you refrigerate apple cake? Check the frosting. Icing made with milk, butter, whipped cream, or cream cheese should be refrigerated. How long does homemade apple cake last? In the bowl of a stand mixer cream the butter and the sugar until fluffy, about two minutes. Add eggs one at a time mixing well after each addition. Add the applesauce and mix until combined well. Add the dry ingredients mixing until just combined. Spoon batter into a half-sized bundt pan sprayed with non-stick spray. Cover with foil, tightly. Lock the lid in place. Select High Pressure and set the timer for 25 minutes. When beep sounds, turn off pressure cooker and use a natural pressure release for 10 minutes and then do a quick pressure release to release any remaining pressure. When the valve drops carefully remove the lid. Carefully remove the bundt pan to a wire rack to cool uncovered for 10 minutes. Use caution removing foil from pan, don't burn yourself. After 10 minutes, remove from pan and cool on a wire rack. When cake is cool drizzle with maple glaze. In a small bowl combine melted butter and milk, whisk together. Add maple flavoring and stir together. Add powdered sugar to desired consistency (I like my a little thicker, but thin enough to drizzle from the end of my whisk). If you get it too thick, just add milk (a tiny bit at a time) until it's the consistency you want. Combine dry ingredients and set aside. Mix up the wet ingredients and then add the dry ingredients and mix until just combined. Overmixing can make a tougher cake. When making baked goods allow ingredients to come to room temperature. Don’t forget to cover the cake with aluminum foil when placing in the Instant Pot. This keeps the steam and water drops off the cake.